« Need a Hat for the Winter? Make one! “The buck stops here.” That was President Harry Truman’s favorite phrase – or at least the one we remember the most. It is also one that has been on my mind all weekend. More about that later. In the meantime, I took a two day trip to NE Iowa for some post birthday fun and a little trout fishing. The first stop was at the cemetery near Maquoketa to decorate the graves of the maternal grandparents. Some of my mother’s ashes are sprinkled there. It’s been quite a few months since memories of Mom brought tears. This time I felt the same sadness and loss though perhaps not quite as intense. Sis and I sure do miss Mom though. From there it was on to Bellevue Iowa, along the Mississippi River. 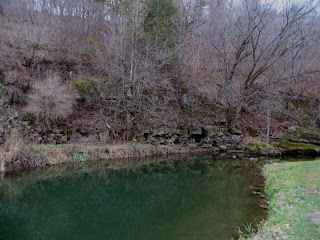 A few weeks ago Dad and I went to Little Mill creek to do some trout fishing. With the majority of the stream fishing winding down for the year, it appeared as though the creek had not been stocked for a while. It took some doing but I got a few trout out of the water and managed to have some fun along the way. There is the new hat along with the usual tie dyed apparel. It blends in pretty nicely outside. With the fall deer hunting seasons underway, hopefully I don’t blend in too well! Here is Beulah. At least that’s what I called her. As I was climbing up the steep bank at Little Mill creek, I heard snorting noises. 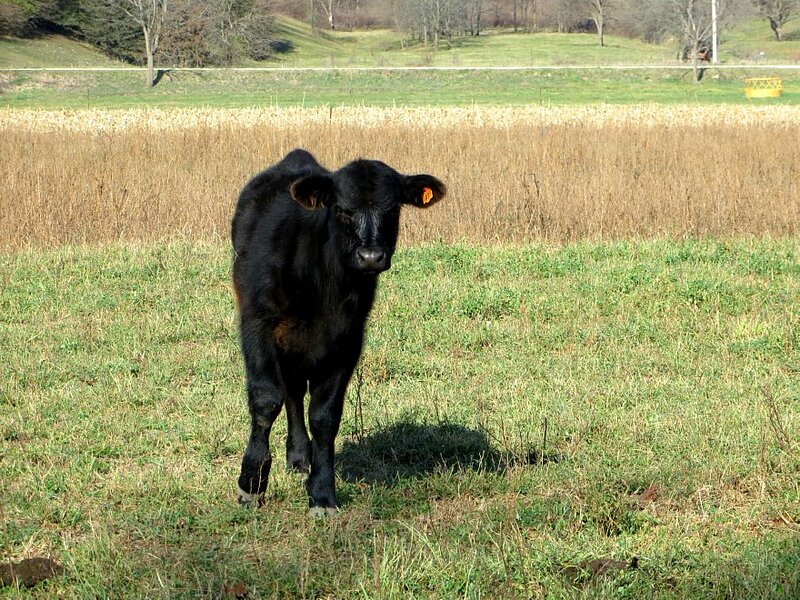 As my head popped up, I came eye to eye with this cute little cow… Yeah, that’s what your Black Angus Burger looks like! “Beulah” was actually quite friendly and didn’t bother me at all. It was then I noticed that there was nothing separating us. The electric fence wire was on the ground. It’s good she was friendly. Another little camping story…. 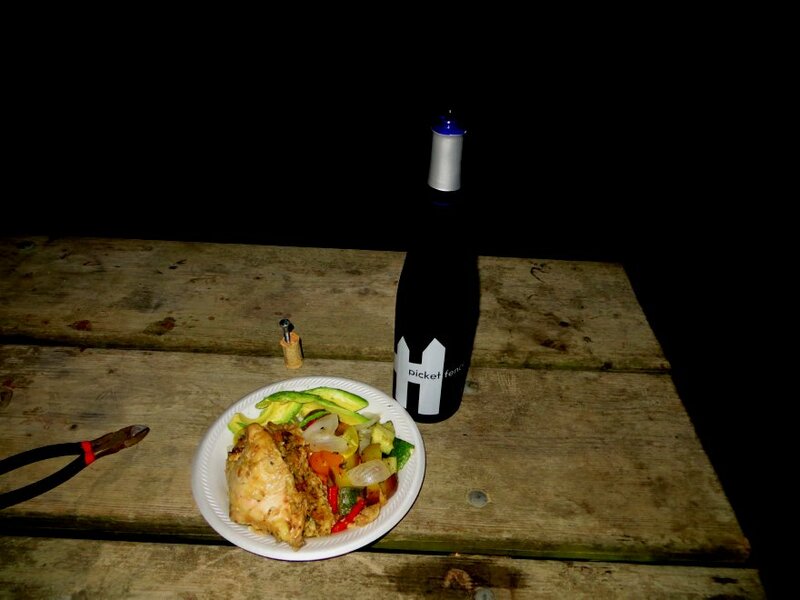 After fishing in the cool, misty fall air, the stomach kicked up into full gear. It always seems a person has to go number two at the worst of times. After fishing, I made it back to the van and pulled out the Luggable Loo. 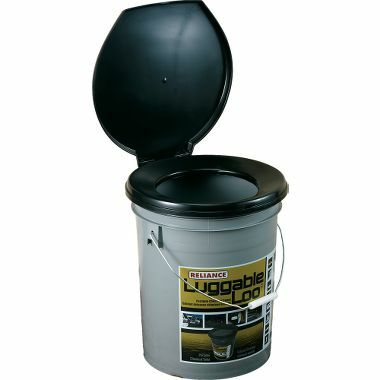 (For non-campers, the Luggable Loo is a toilet seat that snaps on a 5 gallon bucket which most people line with a garbage bag). Though parked at the end of a long gravel drive, I decided to “go” by the front of the van to remain unseen should anyone come upon the vehicle. As soon as I had sat down on the plastic throne a truck turned in! By this time I had finished “business” and nobody was any the wiser. For fishermen or campers, I strongly urge you to buy something like the Luggable Loo for your… “strong urges“. To me it’s more comfortable to use a bucket than one of those stinky wooden outhouses! After discreetly putting the “throne” away, I struck up a conversation with the older couple in the truck. We talked for some time about camping and they were intrigued with the van and the lifestyle. You could see the longing in their eyes. A person can tell when people have that urge to roam! After leaving Bellevue, I paused briefly at the Our Lady of the Mississippi Abbey just south of Dubuque. The nuns there make the most delightful caramels, caramel sauce, and maple syrup to help support their group. 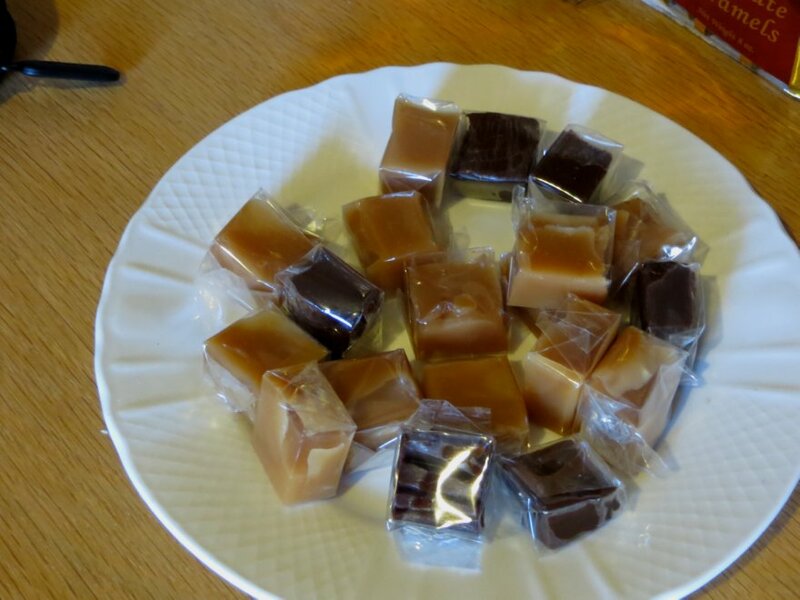 I bought a number of caramels and such for Christmas presents. The nuns set out free samples and a few made it into the jacket pocket for a fishing treat. The rest of the day was spent heading north and getting set up for dinner and camping out. The plans changed a little and I ended up camping at a little county park called “Buck Creek.” This was a new-to-me trout stream. It is located on Highway 52 near Garnavillo, Iowa and about ten miles east of Elkader. The county permits free primitive camping. 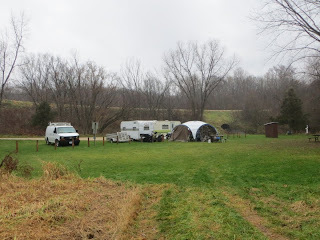 Here is a picture of the campground. The other occupants are a group of deer hunters. 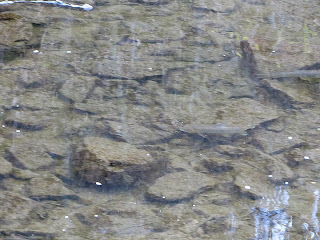 Due to the drought, the water is extremely shallow at Buck Creek as you can see in the next picture. 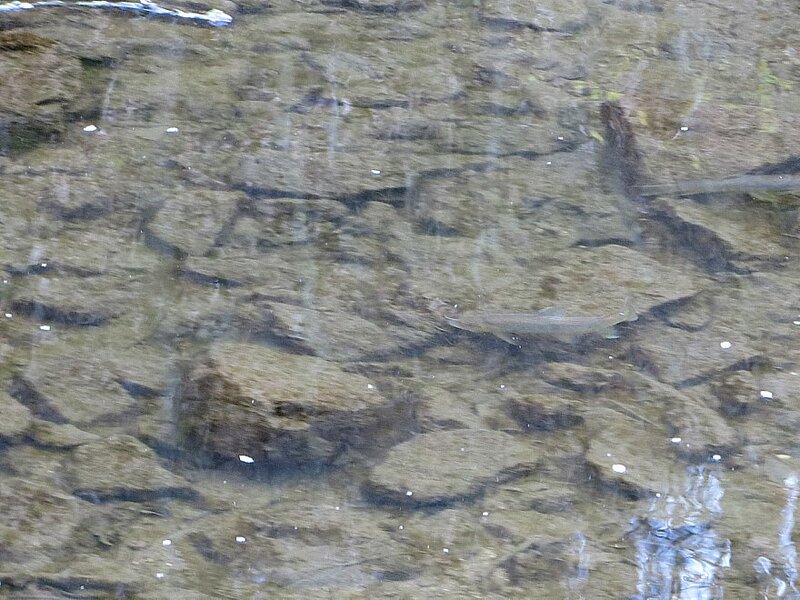 Can you spot the fish in the photo? Buck Creek is so clean that in this area you can see the bottom. Believe it or not, you are looking through about two to three feet of water. The fish can see you as easily as you can see them. 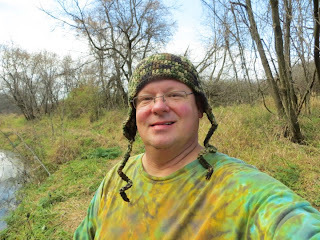 This time around I used the woodsy looking tie dye and my crocheted cap. It really did the trick. With a slightly dim afternoon light they didn’t notice me… not like the fish did when I would wear the usual loud rainbow swirl tie dyed shirt. Dinner was cooked in one of those Emeril Lagasse Smoker Bags. I also used a variety of veggies including shallots, onions, peppers, summer squash, zucchini, and baby potatoes. A few chicken breasts were seasoned and cooked in the same bag. Some avocado slices on the plate made the whole thing even tastier. Yes, that’s wine, not Diet Coke. Note the corkscrew – a lag bolt of the same type that holds my bed together… I threaded it into the cork and used a pair of diagonal cutters to jerk the cork out… No need to reseal the bottle… It didn’t last all that long. The beverage was a semi-sweet white wine from Park Farm Winery, a local winery located north of Dubuque on Highway 52, near Bankston Park. I sampled a couple of different types before deciding that the Picket Fence was a perfect choice for chicken or fish. It was really good stuff! I can see a future trip coming together… Bankston Park is a great place to camp and trout fish… The winery is nearby. I hope spring comes soon. After feeling just a little sluggish from the good meal and wine, I got up early this morning and headed toward the town of Decorah. That turned out out to be slower paced fun. More about Decorah tomorrow though. It is getting late and there are some fish to clean. If I get some time tomorrow, there will be some more pictures. I tried a “new” trout stream this morning with excellent results. The natives also steered me toward a healthy foods cooperative with great food as well as to “Dirty Dan’s Laundromat” – a story in itself. It’s been another spontaneous, zany day to say the least! Oh year… The buck stops here? Well, it was ironic about Buck Creek park and I crossing paths. The bucks – the money from working – might be ending. The job at the big box store is getting rough. The physical work is not bad but it was extremely stressful – more than I can handle. The turnover is very high. One of the reasons for this trip is to decide if the deli job is one I can keep doing… So who knows… If I bail out, the bucks might stop here… In Decorah. I don’t feel like going back! Hmmm… A full tank of gas… 2 days limit of trout in the cooler… Who knows what’s next? Thanks for riding along, as always! 2 Responses to The Buck Stops Here? Wishing you the best in your decision about work. Stress sure does take the life out of living. Thanks Tinycamper! It’s been very tough. That’s the danger of van camping and enjoying a more nomadic life. It can undermine a person’s tolerance. I ended up quitting today… There’s no looking back – just looking forward. Something good has got to be out there.